Amplifier power supplies are heavy and unwieldy and typically take up precious space on the floor behind an operating table. When I started this project, therefore, I decided to consolidate all of my big power supplies into two relatively compact versions - one for tubes in the 2.5-3.0 KV class, such as the 3-500Z, 3CX800, and GU74B, and one for tubes in the 3.5-4.5 KV class, such as the 8877 and 4CX1000A. In principle, there's nothing complex about an HV power supply: transformer, rectifier, filter capacitor, and it's pretty much done. However, the power supplies described here are complicated by their need to accomodate multiple RF decks. Safety and reliability require especially close attention to ground returns, B- current paths, and metering interactions, a lesson I learned the hard way when I was seventeen and disconnected the coax from a homebrew pair of 813s, not knowing that the HV return was the coax shield. The 2000V jolt threw me backwards against a wall, breaking the chair and nearly breaking my shoulder. I was lucky, because that kind of lesson seldom gives one a chance to learn from his mistakes. Each power supply weighs about 120 lbs, with 67 lbs coming from a custom tape-wound transformer manufactured by P.W. Dahl. The front panels were fabricated by Front Panel Express and have a black powder-coated finish, with engraved lettering (white for one power supply, yellow for the other). I had the sheet metal and other panels powder-coated for me by a local Santa Fe company. Bare power supply enclosure, showing vent for air circulation. A muffin fan is attached to a similar hole on the other side of the enclosure. The holes were cut with a fly-cutter on a drill press, at a very slow speed with lots of cutting oil. The dimensions are 12"Wx10"Hx20"D. The higher voltage supply is 1.5" deeper, because of the larger filter capacitor. Interior view of the power supply enclosure, showing the internal construction of the frame and panels. The front, rear, and top panels are 1/8" aluminum plate, and the bottom panel is 3/16" aluminum. All panels are attached to a frame of square 1/2" aluminum stock, the same as used in the RF deck. 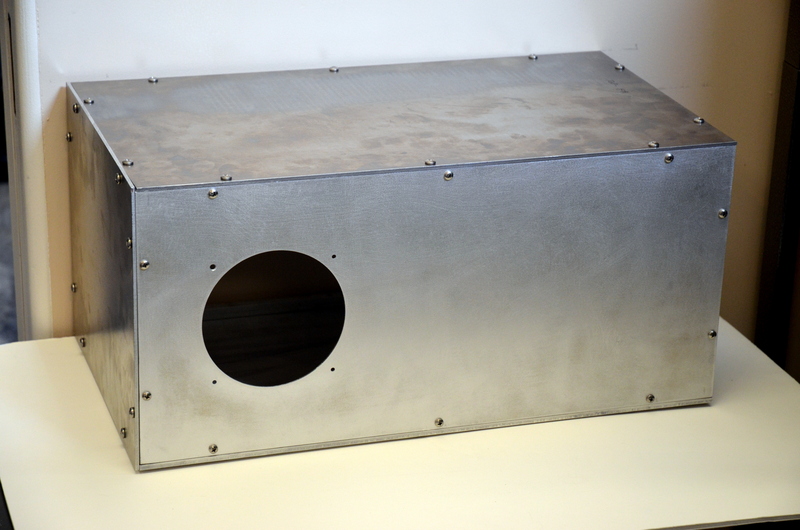 This is the bare aluminum subpanel before attaching components. There are about fifty Pem nuts, clearance holes, threaded spacers and standoffs and grommets in the plate. Pem nuts are a fast and convenient way to attach components and are used throughout the amplifier and power supply . A CMOS logic circuit allows each power supply to operate up to three RF amplifiers. This breadboard lashup helped me troubleshoot the design before transferring it to printed circuit boards. Click HERE to see a YouTube demo of the circuit's operation. This control printed circuit board measures 6.0 x 7.5 inches. Three SPST latching vacuum relays (Gigavac G81A) are shown in the upper right, covered by a safety shield. The relays are rated at 5A/10 kV and route high voltage to the selected RF deck. The relays are specially designed to hot switch DC voltages. The CMOS control PCB is attached to the front of the aluminum subpanel. The 12VAC control transformer is also mounted on the panel, along with a power relay for switching primary taps on the plate transformer. Four diode rectifier blocks (8 kV@1.5A each), two 100K/100 Watt bleeder resistors and miscellaneous other parts mount on the rear side of the subpanel. The HV wire is silicone insulated test lead wire, rated at 10KV, and is much more flexible than ordinary HV wire. Note that the HV bleeder resistors in the left photo are supported by homemade Teflon mounting standoffs, shown here beside the original standoffs. The bleeder resistors are at full power supply potential, and the Teflon insulators ensure against flashover through the ceramic coating on the resistors. Here is the larger (4kV) power supply with the major components mounted, prior to wiring. The Russian 50uF/5KV filter capacitor is outstanding quality but was painted an ugly pink. Over my dead body was I going to use a pink capacitor, so I repainted it a manly battleship gray!. Oil filled capacitors don't come with mounting brackets, so I had to fabricate my own, shown here for the lower (3kV) voltage supply. This capacitor is rated at 50uF/4.2 kV. It's a fine, very compact capacitor, but don't ask me where I got it because I don't remember. Closeup showing the 67 lb (5kVA) Peter Dahl plate transformer and the 5 kV oil-filled filter capacitor. By mixing and matching taps the transformer can supply six RMS voltages from 2000 VAC to 3300 VAC (1920 VAC to 2250 VAC for the lower voltage transformer). The primary wires of the plate transformer were so stiff I couldn't find a suitable barrier strip for them. I ended up making my own out of fiberglass and copper-bronze hardware. The front panel tilts down for servicing. Note the two 50 Amp solid state relays on the lower right. A 30A/250V magnetic circuit breaker is also in series with the AC line. Another view of the power supply with the front panel tilted. Note the high voltage disc capacitors bypassing the HV terminals, and the key-operated safety switch.